How Goes The Mancave / Brewery? I'm not too sure where I left off on my post about my Mancave / Brewery build but I suspect it was back in July. 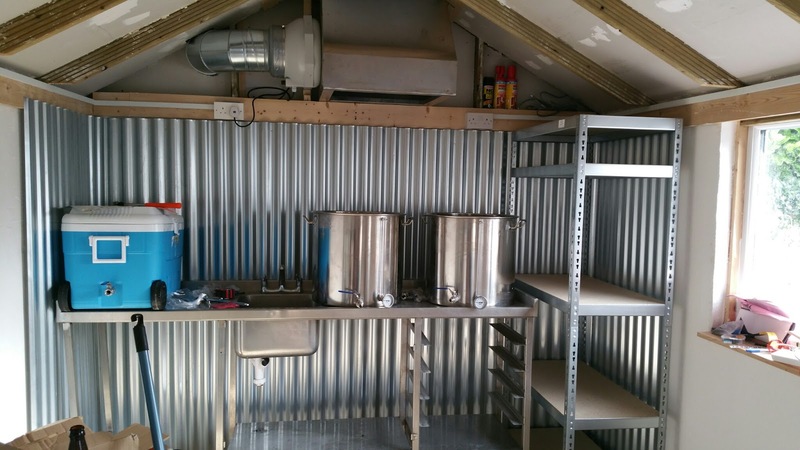 The space is now mostly usable for brewing. The extractor fan works and I even have a gym on the far side. I have my hoses hanging up, they will need to be cut shorter once I am ready to use them with the pumps. The problem of course is finishing off the brewery itself. All of these stainless steel bits add up in cost and then I always seem to be missing something. There was catastrophic failure a few months ago when I tried a test run outside. There were leaks everywhere. Apparently, all that white stuff that I took for packaging was there for a reason. I discovered it was plumbers tape so I had to go off and buy some and wrap all of my connectors in it again. They look lovely though. 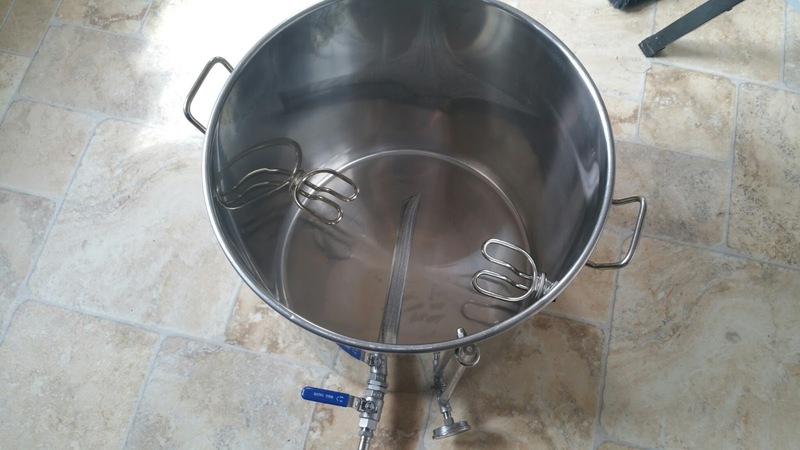 This one is the kettle with two elements. One of them kept shorting out. I hope it's just because water got into it during the test but it could also be faulty. The plastic tubing on the sight glass was also a challenge. I kept breaking one of them until it was no longer useful. I decided to go for a metal/glass combo as it must surely be more robust. Unfortunately, the connector that the tube screws into was out of stock at the time. I was offered a refund or half off for just the tube. I went for just the tube on the off-chance it fit in to my current connector. It didn't of course and I couldn't get a separate connector so I bought a smaller gauge just to get and use the connector. Queue the next mess, I also needed to increase the size of the hole in my pot to take the new connector and without thinking about it, I used my hole punch. That was a mistake because I used the larger one for an element instead of the 1/2 inch one for a tap. So, now I need to stick a new element in that kettle to fill that hole. 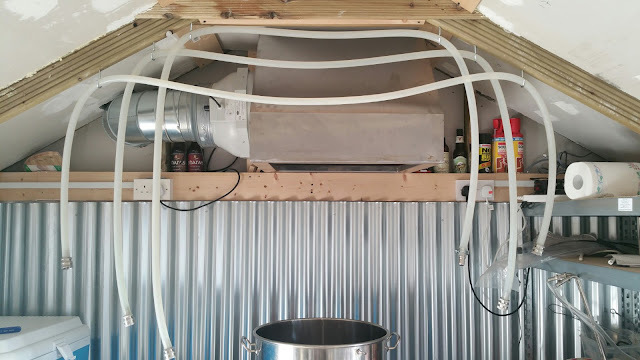 No big deal, it's just the HLT and it might be useful to have a second element in there to speed things up. I have now ordered that element as well as one of these nifty temperature control units for my chest freezer so I can turn it in to a fermentation chamber. I do have a couple of STC1000 units but I simply can't be bothered wiring them up DIY when I can get a ready to go unit that will do the same thing. For now, I can still brew using my old plastic equipment and plan on doing so this weekend. Oh and it's not plumbed yet either so a hose through the window and a bucket under the sink is the best I can do at the moment. 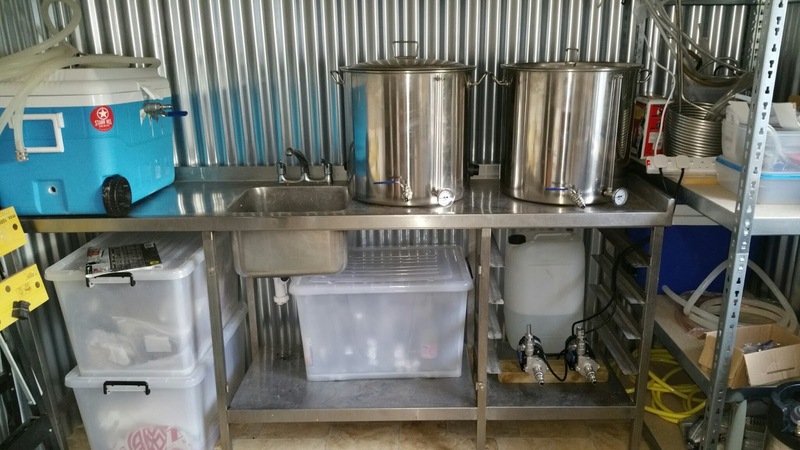 This brewery is a never ending work in progress and money pit! The Tale Of The Ale: How Goes The Mancave / Brewery?